Mary Margaret McKeown (born May 11, 1951) is a United States Circuit Judge of the United States Court of Appeals for the Ninth Circuit, and is based in San Diego, California. 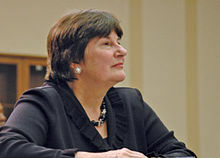 McKeown has served on the Ninth Circuit since her confirmation in 1998. McKeown had been mentioned by some as a possible future United States Supreme Court nominee. McKeown, a native of Casper, Wyoming, graduated from Kelly Walsh High School in Casper in 1969. She received her Bachelor of Arts degree from the University of Wyoming in 1972, graduating Phi Beta Kappa, and her Juris Doctor from Georgetown University Law Center in 1975. She has also received an honorary Doctor of Laws degree from Georgetown and studied at the University of Madrid. Judge McKeown is an adjunct professor at the University of Washington Law School and at the University of San Diego School of Law. She is best known in academia for her work in intellectual property law. McKeown was the first female partner with the law firm of Perkins Coie in Seattle, Washington, and Washington, D.C., representing clients like Boeing, Nintendo and Citicorp during her time at the firm, from 1975 until 1998. McKeown also served in the White House as a White House fellow under President Jimmy Carter, working as a special assistant to the United States Secretary of the Interior Cecil D. Andrus from 1980 until 1981. McKeown was nominated for a seat on the United States Court of Appeals for the Ninth Circuit by President Bill Clinton on March 29, 1996, and then renominated by Clinton on January 7, 1997. McKeown was confirmed by the United States Senate on March 27, 1998, by a vote of 80-11. She received her commission on April 8, 1998. She is currently duty stationed in San Diego, California. McKeown is on the Board of the Federal Judges Association. On September 6, 2007, Judge McKeown penned a judgment (for a three-judge panel) which affirmed a lower court ruling that banned display of a Christian cross in a federal nature preserve. She ruled that it was an impermissible governmental endorsement of religion: the Establishment Clause of the United States Constitution bars the government from favoring any one religion, as it specifically applied to a white metal Latin cross in the Mojave National Preserve in southern California between Los Angeles and Las Vegas. The United States Supreme Court reversed this decision by a vote of 5-4 and remanded the case. Judge McKeown was elected to the American Law Institute in 1993 and was elected to the ALI Council in 2009. She serves as an Adviser on several ALI projects: the Restatement Fourth, Foreign Relations Law of the United States-Treaties; the Restatement Third, The U.S. Law of International Commercial Arbitration project; and the International Intellectual Property project. ^ "University of San Diego Jurist in Resident Profile". Archived from the original on 2006-09-01. ^ Salazar v. Buono, 130 S. Ct. 1803 (2010). ^ "Restatement Fourth, The Foreign Relations Law of the United States - Project Participants". Archived from the original on 2014-04-07. ^ "Restatement Third, The U.S. Law of International Commercial Arbitration - List of Project Participants". Archived from the original on 2010-12-05. M. Margaret McKeown at the Biographical Directory of Federal Judges, a public domain publication of the Federal Judicial Center. This page was last edited on 8 April 2019, at 17:40 (UTC).